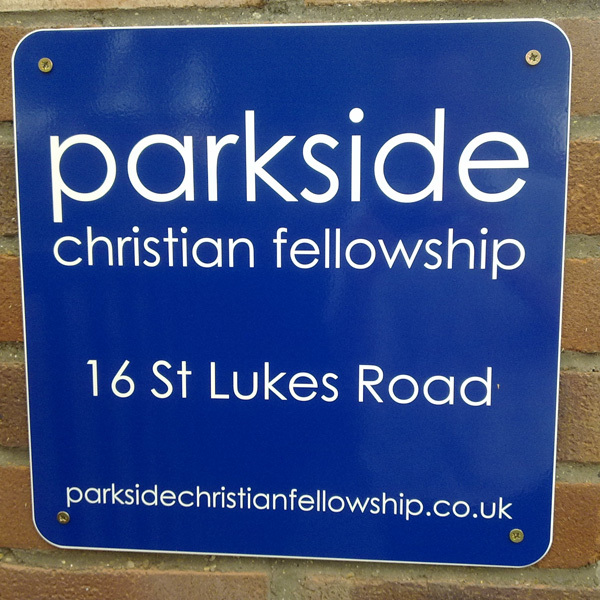 July has been another busy month for us at Parkside Christian Fellowship. We had another good Coffee in the Park on the 17th and a great turnout for the Toddlers Teddy Bears Picnic in the park on Wednesday 21st July. We’ve also enjoyed some excellent teaching on subjects as diverse as Giving, Worship and Prayer. In addition we’ve been making plans for the first Community BBQ which will be on the 14th August for our near neighbours in St Lukes Road and surrounding area. Invitations will be going out this weekend and we’re hopeful of seeing a good number joining us. We’ve now got the first of our new signs up following our name change earlier this year – see the attached photo. Over the next few months we’ll be investing in a new noticeboard as well as making further changes at the front of the building.